Get the most from your personal training session with one-on-one coaching! Your workout program will be created specially for you by the best personal trainers in Bracebridge. The advantage of our one-on-one personal training program is the benefit of having your own personalized workout plan. Our back ground will help us create a better program for you helping you reach your results faster. Our Personal Trainers will work with you to make sure you are well equipped to reach your desired goals. Having your own tailored program will maximize your potential with each training session, this will lead to you reaching your goal in the shortest time possible. 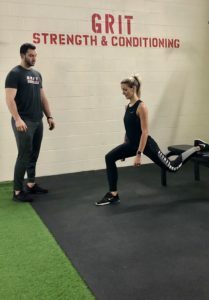 Having one-on-one access to a Personal Trainer will make you feel more confident in reaching your goals with each workout and help to build your self-confidence. At Grit our Personal Trainers, or Coaches as we call them, have a special eye from our history of training and education for proper form where most trainers would miss this resulting in your injury. Send us a email to set up your free consultation and assessment!